The Khaled bin Sultan Living Oceans Foundation conducted a research mission to the Galápagos Islands in 2012 as part of its Global Reef Expedition. This scientific article on Galápagos coral reef persistence, written by several science team members, is a result of research conducted during that mission. Anthropogenic CO2 is causing warming and ocean acidification. Coral reefs are being severely impacted, yet confusion lingers regarding how reefs will respond to these stressors over this century. 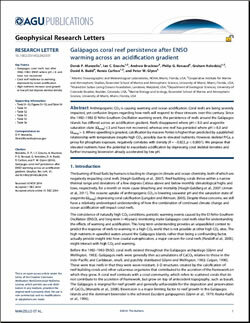 Since the 1982–1983 El Niño–Southern Oscillation warming event, the persistence of reefs around the Galápagos Islands has differed across an acidification gradient. Reefs disappeared where pH < 8.0 and aragonite saturation state (Ωarag) ≤ 3 and have not recovered, whereas one reef has persisted where pH > 8.0 and Ωarag > 3. Where upwelling is greatest, calcification by massive Porites is higher than predicted by a published relationship with temperature despite high CO2, possibly due to elevated nutrients. However, skeletal P/Ca, a proxy for phosphate exposure, negatively correlates with density (R = −0.822, p < 0.0001). We propose that elevated nutrients have the potential to exacerbate acidification by depressing coral skeletal densities and further increasing bioerosion already accelerated by low pH. The burning of fossil fuels by humans is leading to changes in climate and ocean chemistry, both of which are negatively impacting coral reefs [Hoegh-Guldberg et al., 2007]. Reef-building corals thrive within a narrow thermal range and deviations of a few degrees Celsius above and below monthly climatological highs and lows, respectively, for a month or more cause bleaching and mortality [Hoegh-Guldberg et al., 2007; Lirman et al., 2011]. The oceanic uptake of anthropogenic CO2 is lowering seawater pH and the saturation state of aragonite (Ωarag), depressing coral calcification [Langdon and Atkinson, 2005]. Despite these concerns, we still have a relatively undeveloped understanding of how the combination of continued climate change and ocean acidification will impact coral reefs. The coincidence of naturally high CO2 conditions, periodic warming events caused by the El Niño–Southern Oscillation (ENSO), and long-term (~40 years) monitoring make Galápagos coral reefs ideal for understanding the effects of warming and acidification. This long-term understanding provides an unparalleled context to predict the response of reefs to warming in a high CO2 world that is not possible at other high CO2 sites. The high nutrients in upwelled waters around the Galápagos Islands, rather than being a confounding factor, actually provide insight into how coastal eutrophication, a major concern for coral reefs [Pandolfi et al., 2005], might interact with high CO2 and warming. Before the 1982–1983 ENSO, coral reefs existed throughout the Galápagos archipelago [Glynn and Wellington, 1983]. Galápagos reefs were generally thin accumulations of CaCO3 relative to those in the Indo-Pacific and Caribbean, small, and patchily distributed [Glynn and Wellington, 1983; Colgan, 1990]. These were true reefs in that they were wave-resistant, 3-D structures created by the calcification of reef-building corals and other calcareous organisms that contributed to the accretion of the framework on which they grew. A coral reef contrasts with a coral community, which refers to scattered corals that do not contribute to the accretion of framework, but grow on top of antecedent topography, such as basalt. The Galápagos is marginal for reef growth and generally unfavorable for the deposition and preservation of CaCO3 [Manzello et al., 2008]. Bioerosion is a major limiting factor to reef growth in the Galápagos Islands and the dominant bioeroder is the echinoid Eucidaris galapagensis [Glynn et al., 1979; Reaka-Kudla et al., 1996].